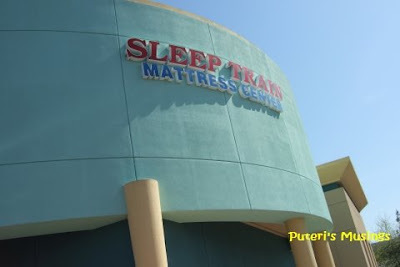 Last Saturday, we went to Sleep Train so that I could check out the mattresses there. My goodness, mattresses are expensive! My waveless water bed has outlived its usefulness. One tube burst it's seam and after fixing it once before it burst again. That's it, time to get a new mattress! I tried a few mattresses and stayed away from the plush top ones. I prefer my mattress comfortable but slightly firm. I finally decided on a latex mattress - synthetic was all they had. It reminded me a lot of the latex mattress I had at my parent's home. The kids left the store with a stuffed animal each. That's Ba Bear with the pink bunny rabbit that Denice got from the store. Since we got to the store after 2.30 p.m. they were unable to deliver it that day. Today, there was no delivery due to the Easter holiday. So my new mattress will only be delivered tomorrow. The old one is already outside, and Sleep Train will dispose of that old mattress for me. As I will be getting a new mattress, I thought a new quilt would go well with it! This batik quilt was made about two years ago, but I never did finish the binding on it. I trimmed the sides, and need to get to work with the binding. Duncan loves to sit on my quilt every time I lay it out on the floor. 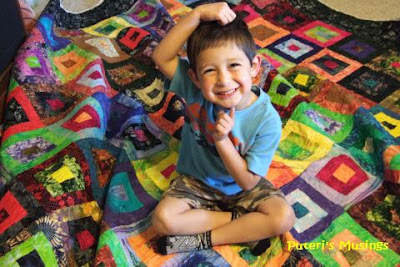 He even did Snow Angel moves on the wrong side of the quilt. The white backing reminded him of snow. I can't wait for my new mattress to arrive. Meanwhile, I am sleeping on a twin bed, and Doug is sleeping in the guest bedroom. PS: Wah, Denice taller than Duncan already! So you like the hospital bed, eh! The twin bed I have is an adjustable bed. I got it when I was pregnant, because my hips hurt when I lay on my side, and with a big tummy you are not supposed to lie flat on your back! That twin bed is very useful, esp when you are sick, with nasal drip, stuffed nose .... like you say! And for watching tv, and reading in bed too! 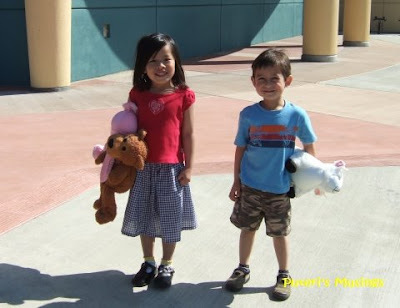 Denice has always been taller than Duncan, but she seems to have grown a lot faster than Duncan now. Eh, I also prefer a firmer mattress. Never been on a water bed before, how does it feel? We thought about getting a new mattress too.. Robert wanted a pillow-top mattress, I wanted a firm one.... How..??? I love your quilt.. Very colourful. Ya, too soft, back sakit next time! HI, water bed very comfortable, the waveless kind la. But the top padding after 8 years started sagging and that was not good for my back. That is one reason I avoided the pillow top or plush top for my new mattress, because eventually that top layer will sag. Only one of the tubes burst its seams ... but since I was already not happy with the sagging pad, we decided to get a new mattress instead of replacing the broken tube. Cat, like I mentioned above, pillow top/plush top will sag, and eventually not comfortable. Better to get the normal ones. My latex mattress has a 20 year warranty. First 10 years, if it sags a certain number of inches, can be replaced. The next ten years, pro-rated (?) warranty. Every other mattress only has 10 year warranty. Mattress arrived at 8.30 this morning .. woo hoo tonight sleep on new tilam! Maybe I should consider latex mattress when my pillowtop starts to sag! Hopefully not so soon..like you said..mattress not cheap! Louisa, the mattress was very comfortable! I was even able to lie on my left hip that was hurting! Fantastic! Doug said I snored right till morning! Hehehe, the cough medicine helped me sleep very well indeed! Puteri, what happened to your hip sakit? Hope it gets better. Take care. Yikes, kidney stones! I had kidney stones before, as well and let me tell ya, it was extremely painful. Was 7 months pregnant at the time, too. Had to stay in the hospital overnight. Funny how at first I thought it was back pain and it just got worse and worse..sampai muntah from the pain..ack.. the memories! Anyway, Puteri, if you suspect kidney stones, just be sure to drink plenty of water to flush them out, k? From time to time, I would feel a twinge in my back and take it as a reminder to drink extra water. Could be your body doing the same thing? Louisa, I used to have little stones that I was able to pass out in the past. Probably this one or ones (?) is/are bigger and cannot be passed out naturally. Those little ones, smaller than a grain of rice, my goodness, they sure can give you a lot of pain as they are passed out!! You are right about drinking lots of water. I don't drink enough, and I should drink more. Most of the pain is concentrated on my left hip area and upper thigh. I sometimes feel some dull pain in the back too. Dunlopillo is synnonymous with matresses as Colgate is to toothpaste. The price of latex mattress is beyond us now and so we have to resort to the spring mattress. Now the latest brand of latex mattress is Getha. They are comfortable but as with anything that is good...expensive. The once lowly rubber latex has reached the pinnacle of usefullness other than being made into tyres. Ya, latex mattress is very expensive. The one I have is synthetic latex. I like it a lot. Eight years ago, a 6 inch thick latex mattress was about $1k. Imagine how much it would cost now? Getha? I must look for it when next I am in Malaysia! Ya, Dunlopillow is very expensive! Just the pillow alone cost over RM200! Cey! Hey Puteri ... I feel bad now. See, I shared a joke on Seniors being Valuable because they have amongst other things - stones in their kidneys! Hope you are free of ALL pain very soon! Did you try out the Sleep Number bed? I am somewhat taken in by the fact that it works on different setting for individuals. Tidur pun susah as the years pile up. Sigh. Lesley, about time you get your own new mattress, lor! They have a lot of comfortable ones at Sleep Train, but I still don't trust springs! Hehe. Guess I am almost in the Senior club .. with kidney stones and all. Actually, my lower back feels a lot better since sleeping on the new mattress. Even the pain in my left hip has subsided some what. My previous waveless water bed is quite similar to the Sleep Number bed. You can put in more or less water in the tubes. But I think the sleep number bed will eventually have the same problem with the water bed. The air compartments can puncture, and the foam padding will eventually sag. That was one reason I did not want to go for that particular bed. So far the latex mattress is working rather well. Sleep Train says I have 3 months to change my mind! Not likely though unless the mattress sags before its time! Never knew shopping for mattress can cause you such considering ... hehe..
Hi Puteri, wow! you sure got beautiful kids. And I guess beauty runs in the family, huh? Here's hoping you and Doug and kiddos all doing well, stay easy and have a nice day, L.
Ya, ya, no new post in a while! Busy doing other things!